A Spicy Collection Of Cooking Tips And Jalapeno Pepper Recipes For Adding A Little Heat To Your Kitchen! Do you love cooking with jalapenos? 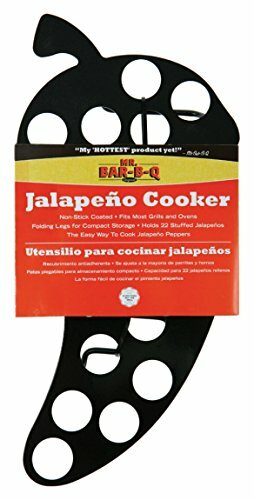 Learn safe handling tips, preparation techniques, cooking tips, how to treat a burn, health benefits, how to grow jalapeno pepper plants and so much more, plus browse our spicy collection of the most amazing and best tasting jalapeno pepper recipes ever! Jalapenos are widely known for their use in traditional South American cuisine and the spicy pepper’s popularity has expanded to include European, Asian and Western cuisine. 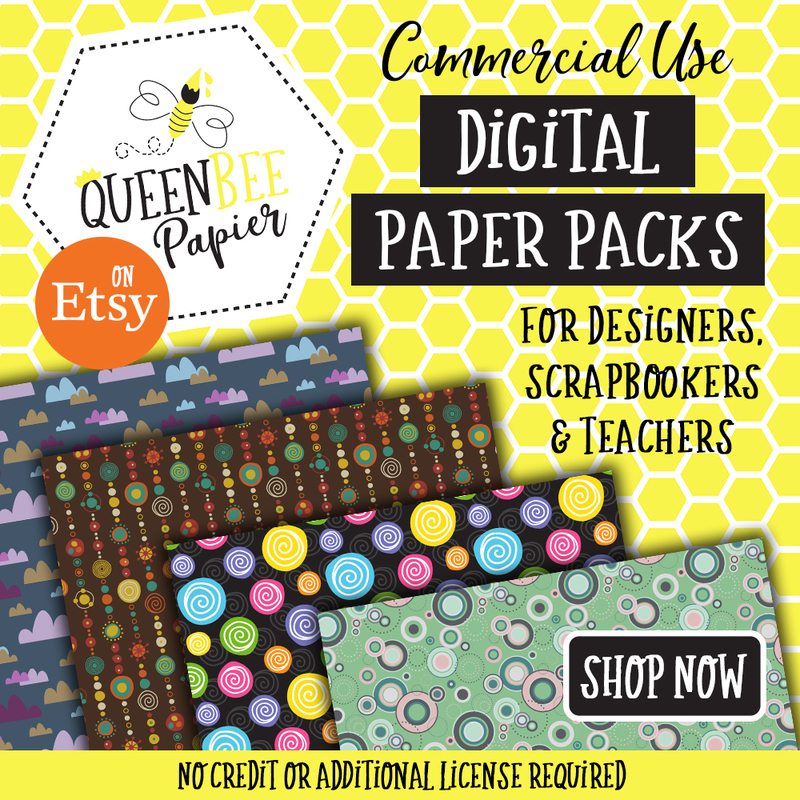 They are a hardy garden plant that can be grown almost anywhere in the world and are found in most grocery stores or markets worldwide. You can even grow them indoors all year round to always have fresh peppers on hand for adding a little zip to your cooking. In the first half of the article, you will find all kinds of tips for cooking with jalapenos including safe handling techniques. 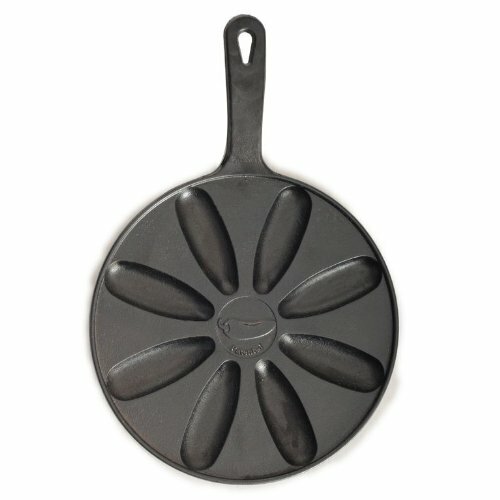 These can be especially helpful if you have never cooked with fresh jalapeno peppers before. 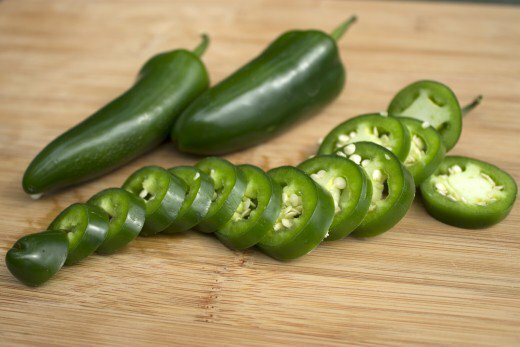 If you’re a jalapeno newbie, you can brush up on your jalapeno knowledge before you begin cooking. The second half of the article features smokin’ hot jalapeno pepper recipes including everything from appetizers, snacks, main dish, desserts, drinks, preserves and more. If you are here looking for a jalapeno pepper recipe that will wow your taste buds and knock the socks off of your friends and family, just skip to the bottom half of the article to browse through our huge collection of jalapeno pepper recipes. 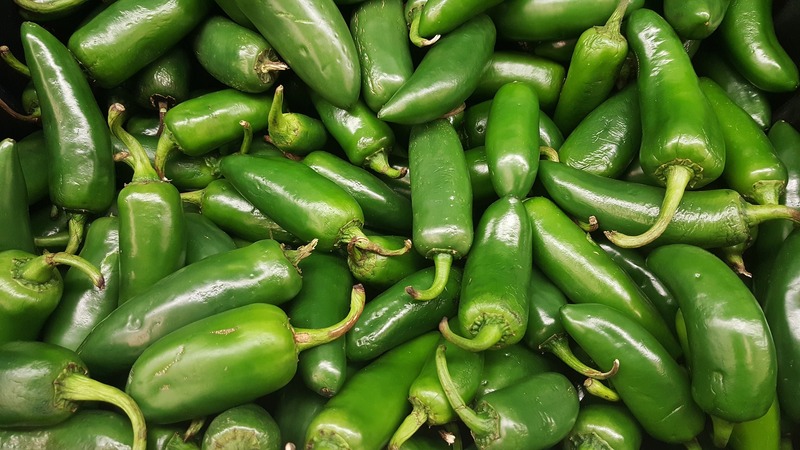 Jalapeno peppers are one of the most common chile peppers used in everyday home cooking and restaurant dishes worldwide and they come from the Capsicum annuum species originating in Mexico. The peppers are usually harvested and eaten while they are still bright green in color and are about 2-1/2″ to 3″ long, though some people prefer to allow the jalapenos to fully ripen into a pretty crimson red color for a sweeter flavor. They have mild to moderately hot heat, ranging from anywhere between 2000 to 8000 Scoville heat units, with the majority of the heat contained in the seeds and membrane of the peppers. Because their flesh is so mild, they are often eaten whole as an appetizer, stuffed with various cheeses, meats and spices. Jalapenos contain capsaicin, a naturally occurring anti-inflammatory and thermogenic compound, are loaded with nutrients and antioxidants and boast several leading edge health benefits. In other words, they are good for you! Capsaicin speeds up your metabolism without raising your heart rate, accelerating fat loss naturally. If you are trying to lose weight, you should eat lots of spicy foods. Capsaicin also lowers cholesterol, is a natural painkiller and anti-inflammatory, and is scientifically proven to reduce the number of cancer cells present in some cancers. Do you suffer from chronic sinus infections, seasonal allergies, headaches and migraines or digestion problems? Capsaicin contains anti-bacterial compounds that help fight and ward off infections and can aid in the treatment of these ailments. Jalapenos are rich in vitamins, minerals and antioxidants that are necessary for supporting and maintaining a healthy body and immune system. They contain vitamins C, K, & A as well as small amounts of vitamin E and B complex. The vitamin C & E also do double duty as powerful antioxidants in the prevention of disease and cancer. One jalapeno alone contains more vitamin C than the recommended daily dose for maintaining healthy tissue repair and immunity. They meet 7% of your daily potassium requirement and also contain the minerals magnesium, manganese, phosphorus, iron, zinc and copper which are important for maintaining a healthy central nervous system and for developing strong bones and red blood cells. Did You Know Chipotles Are Dried And Smoked Jalapenos? Chipotles are jalapenos that are allowed to mature into a deep crimson red and then are dried and smoked. They are usually sold as dried pods, ground up into a powder or canned in sauces and marinades and are most commonly used to season dips, sauces and salsa’s with its earthy and smoky flavor. Store fresh jalapeno peppers in a brown paper bag in the veggie crisper drawer of your refrigerator for up to one week. Whole raw peppers can be safely kept in your fridge for one week. As peppers age, they begin to lose their heat and become sweeter. They also begin to form white lines or striations on the flesh. Fresh jalapenos can aslo be frozen. Toss the peppers whole into a freezer bag or cut the tops off and core them first. They will keep for up to a year in the freezer at their best quality. Beware! Jalapenos are hot! It is very important to take a few precautions when you are handling, seeding and cutting jalapenos because the heat-producing chemical, capsaicin, found in the seeds, membrane and juices of the peppers will cause skin irritation, and in some cases, burns. It is recommended that you wear food-safe latex or vinyl gloves while you are cutting and seeding jalapenos. If you are stubborn like me and don’t like to wear gloves, wash your hands VERY thoroughly afterwards. If you are preparing a large batch, you may want to consider wearing eye protection as well. It is important to remember not to touch anywhere on your face including your nose, ears, mouth and eyes while you are handling the spicy pods. You should also take care not to allow the juices from the peppers to squirt you in the face or eyes. It will burn and you will not be in for a very pleasant experience. This advice also applies to bathroom breaks, especially the men! Make sure you wash your hands before using the washroom and remember that the oils can still be transferred after hand washing. Wash your hands multiple times! The oils from the peppers remain on your hands and still generate heat even after a thorough scrubbing. If you wear contact lenses, you may want to remove them beforehand, because, even hours later, it can still be rather uncomfortable. TIP: After washing your hands really well with soap and water, scrub them with olive oil or butter to dissolve the remaining oils that are left behind on the skin. Capsaicin is fat soluble and non-water soluble, which explains why a simple hand washing is not enough to prevent the transfer of the oils to other areas of your body or the burning sensation that can creep up on your hands hours after you have handled the hot peppers. Never use your nails or fingers to seed or remove the membrane from a hot pepper. The juices will burn your skin and will be extra painful if you have any hang nails or tiny nicks on your hands. Always use a spoon or a jalapeno corer to scoop the insides out. Use A Jalapeno Corer To Make The Job Easier! 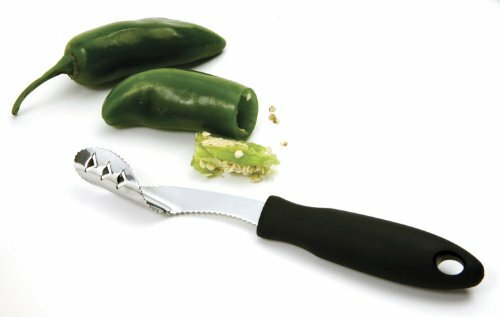 The curved serrated blade of a jalapeno corer makes it quick and easy to slice the top of the pepper off and then to reach inside and scoop out the guts (seeds and membrane) in one motion making the job of coring and seeding dozens of spicy peppers an effortless task. Is Your Mouth On Fire? DON’T Reach For That Glass Of Ice Cold Water Or Beer To Cool Down Your Taste Buds! Capseisin is a non water soluble compound and drinking water can actually intensify the heat. Instead, reach for a glass of milk. Dairy products contain caisen and fat which counteracts the heat and coats the mouth and throat for soothing relief from the hot spice. You don’t eat dairy? Choose drinks that contain some fat and sugar for the most relief. Ouch! 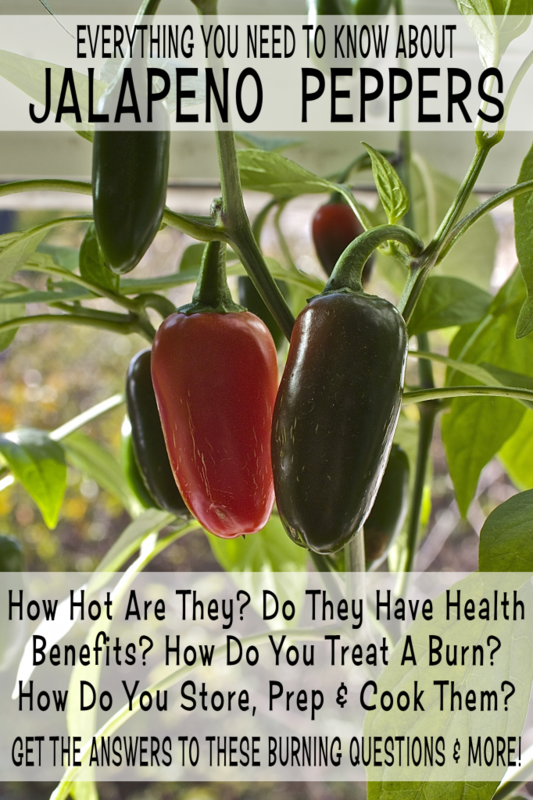 There is not much worse than the burning sensation and scorching pain of a jalapeno burn on your skin including your hands, eyes, ears, nose or heaven forbid, your “down there areas.” If you are unfortunate enough to experience a jalapeno burn or skin irritation, then these tips are for you. If you are suffering from a mild skin irritation or burning sensation, try scrubbing your hands with corn or olive oil, butter or a high fat cream to dissolve the capsaicin oils and then rinse well. Hands on fire? Immerse them in cold milk for 5 minutes for immediate relief. Then make a thick salve out of milk and baking soda and coat the affected areas thoroughly and allow to sit for 20-30 minutes before washing off. Rubbing alcohol also works wonders in providing pain relief from hot pepper burns. Just soak your hands in the alcohol for 3 -4 minutes. While running your hands under numbingly cold water will provide you some temporary relief, water and ice cubes are not effective in treating pepper burns or providing lasting pain relief because capsaicin is not water soluble. Did you accidentally rub your eyes or nose? Or perhaps some juice squirted you in the eye? The pain will be immediate and intense and the first thing you need to do is neutralize the capsaicin oils. I know this is going to sound a little weird, but you need to immerse your eye or nose directly into a bowl of cold milk for at least 5 minutes or until the pain subsides. You can also make a compress out of gauze or cotton balls soaked in cold milk and hold it to the affected area for as long as it takes to stop the burning. As the oils are released, you will need to replace the used milk with fresh milk. Although the pain is unbearable and your eye will be red and bloodshot afterwards, pepper juice will not cause blindness or serious damage. Ok, so you are burning “down there” and are in need of some serious intervention and help. Put the plug in the tub and pour in a jug of milk. Strip down and sit in the cold milk. You can also add a generous sprinkling of baking soda to the tub. Don’t have enough milk to take a bath in? Apply a glob of yogurt or sour cream to your burning bits. The Best Jalapeno Pepper Recipes Ever! Poppers are fresh jalapeno peppers that have been seeded, cored and then stuffed with a variety of cheeses and meats which are then baked, deep-fried or grilled. They are a popular spicy appetizer often served at pubs, tailgate parties and BBQs. They are also sometimes called Armadillo Eggs, Bombers or Stuffed Jalapenos. Enjoy Them Any Way You Like! You Can Stuff ’em, Bake ’em, Grill ’em Or Fry ’em! Even Better, Wrap ’em In Bacon! One of the most delicious and popular ways to cook and eat jalapeno poppers is by breading, flouring or wrapping the stuffed peppers in dough and then deep frying them in hot oil until they are crispy and golden brown. The coated poppers can also be baked in your oven for a healthier version especially if you substitute the traditional heart attack fillings with low-fat cheese and meats. How To Make Deep-Fried Jalapeno Poppers: Heat canola oil to 370F in your deep fryer. 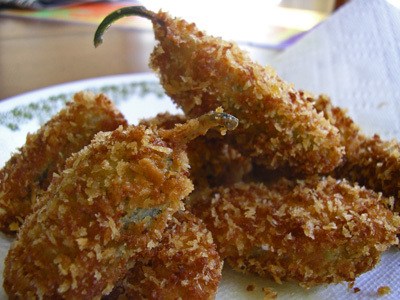 Dip the stuffed jalapenos in buttermilk or beaten egg and then into the flour or bread crumbs. For an extra crispy coating, dip the peppers into the buttermilk or egg, roll them through the flour, take them for a second dip in the buttermilk or egg, and finally, dredge them through some bread crumbs. I like Paanko bread crumbs the best. You can also wrap the stuffed peppers in puff pastry or tempura batter for a more fluffier and bread-like coating. Place the peppers with the open side facing up in your fry basket and slowly lower them into the hot oil for approximately 3 minutes or until they turn golden brown. Drain the poppers on paper towel. Tossing jalapeno poppers in the oven or on the grill is the simplest method for cooking up these hot and spicy treats. They are extra delicious when wrapped them in bacon! How To Make Baked or Grilled Jalapeno Poppers: Heat your oven to 350F and slap the poppers down on a baking sheet and toss them in the oven for 20 minutes until the cheese is melted and the peppers are softened. Or, throw them on a lightly oiled grill and cook them for 30-40 minutes over low heat until they are thoroughly warmed. If they are wrapped in bacon, cook them until the bacon is browned and crispy. 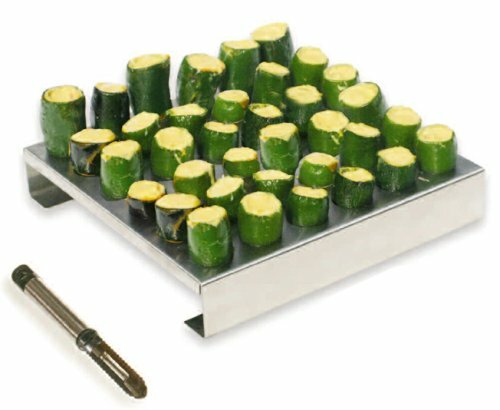 If you love cooking and eating jalapeno poppers, then you must invest in a stainless steel jalapeno pepper roasting rack and corer set. The racks are perfect for holding the little green guys upright while you seed, core and stuff them with yummy, cheesy goodness. When you are done preparing the hot peppers, just toss the whole roasting rack directly onto your BBQ and kick back and relax they until are grilled to perfection. Because the jalapenos are upright, the filling stays inside right where it belongs! Make them even more delicious by wrapping a thick piece of bacon around them first. Soak some toothpicks or skewers in water for at least half an hour. Slice off the tops of the peppers and hollow them out with a spoon or corer, carefully removing the seeds and white membrane. Stuff the peppers with your favorite cream cheese filling using a small spoon. You can also fill a decorating bag with the cheese mixture and pipe it into the middles of the jalapenos to make this job super easy and mess free. Wrap the bombers in a 1/2 slice of thick piece of bacon. Insert two toothpicks into the side of each pepper as pictured on the right. Prop them upright on a tinfoil lined baking sheet. Pop them into a preheated 350F oven for 20-25 mins. Serve them with crackers. Use a jalapeno stuffer to make the job of stuffing the peppers easier. Just fill the stuffer with cheese filling, insert into the top of a pepper and fill each pepper by pushing the rod down. 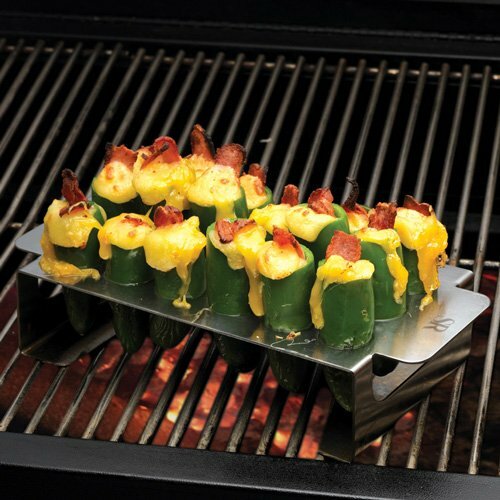 This super creative inside out jalapeno popper takes the traditional popper to a whole new level. If you are feeling ambitious, why not try making this spicy creation for yourself at home? First, you need to weave a blanket of bacon. Cook one side of the bacon weave in a frying pan on the stove until it is lightly browned. 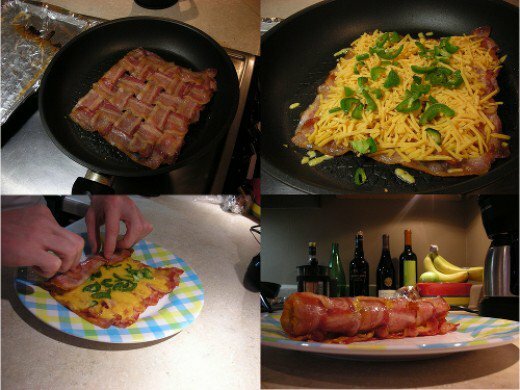 Flip the bacon weave over and cover with your favorite mixture of cheeses and chopped fresh jalapenos. Continue cooking until the bottom is lightly browned and cooked to your liking. Jalapenos stuffed with cheese and steak, wrapped in bacon and then grilled to perfection make a hearty appetizer with a spicy kick that will please your meat-eaters. 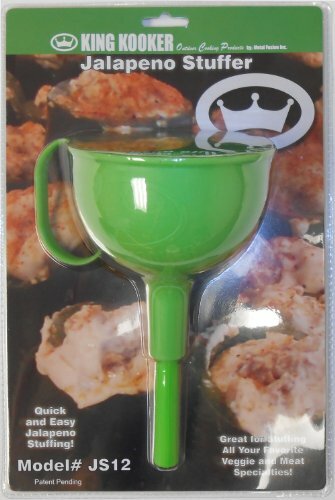 Serve with an ice cold beer! 3 delicious recipes by Food Network’s, George Duran, of Ham On The Street that are absolutely to die for! Make a batch of his tasty huevo ranchero or spicy sausage poppers the next time you are feeding a hungry crowd or try the peanut butter jalapeno popper if you are feeling adventerous. Delicious creamy stuffed jalapenos wrapped in puff pastry and baked to a golden crispiness make great game day snacks guaranteed to score a touchdown with your hungry fans. 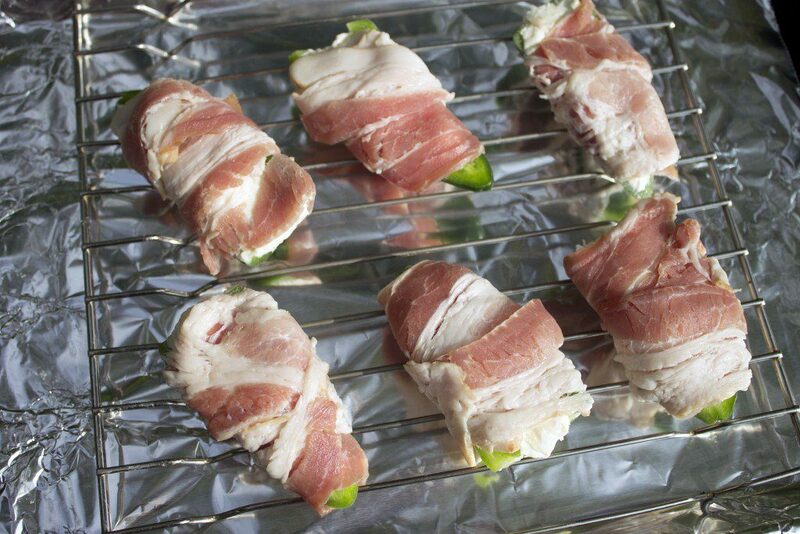 Throw some spicy stuffed jalapeno peppers wrapped in a thick slice of bacon on the grill for a sizzling snack. Salty bacon, hot peppers and creamy cheese are a taste sensation you don’t want to miss out on. If you are looking to mix things up and want to use something other than cream cheese as your base, try stuffing your jalapeno poppers with pimento cheese instead. A delicious variation! These are the most amazing stuffed mushrooms ever! They are loaded with three cheeses, crispy bacon, spicy jalapenos and roasted garlic. Mmmmm! These are a fun love story between crispy baked potato skins meet cheesy hot jalapeno poppers. Top a traditional baked potato skin with chopped roasted peppers for a marriage made in heaven. Wonton wrappers filled with canned chopped jalapenos and cream cheese and baked or fried until they are crispy and lightly browned. These remind me of the chicken taquitos that I like to make for family movie nights. Enjoy the yummy flavors of spicy poppers stuffed into juicy mushrooms for creamy cheesy bites filled with hot peppers and fresh Parmesan cheese. Cook up a big pot of poppin’ chili full of chicken, beans, salsa, corn, spicy hot peppers and creamy cheese on game day and you will walk away a winner. These are so amazing and they make it to my dinner table at least once a month! What could be better than juicy and tender white breast meat stuffed with sharp cheddar jack cheese and cream cheese, diced jalapenos, crunchy bacon and fresh scallions. Serve this spicy and cheesy Tex Mex chicken casserole over a bed of rice or open up a bag of your favorite tortilla chips and scoop up chunks of the saucy chicken, tomatoes, corn and jalapenos for some good ole comfort food with a kick. What could be more amazing than a spicy and cheesy quiche for breakfast or dinner. This egg dish has all the yummy goodness of a jalapeno popper baked right into the quiche. Be warned…this recipe is not for the weak! Knock the socks off your guests with this delicious and super hot extreme quiche pie full of cheese, Chorizo sausages and spicy jalapenos for a meal they will never forget. A bubbling hot and cheesy dip with all the same goodness of a jalapeno popper in half the amount of work and time. The traditional heart attack cream cheese filling of jalapeno poppers undergoes a delicious and healthy make-over in a light jalapeno popper dip perfectly paired with baked corn chips. A yummy popper dip recipe that uses oven roasted jalapenos instead of fresh or canned chilies, giving it a slightly smoky flavor. Having a movie and snack night? This popcorn smothered in garlic butter, fresh jalapenos and parmesan cheese will send your tastebuds on an adventure they will never forget. Can it get any more delicious than this baguette stuffed with a blend of cheeses, bacon, jalapenos, scallions and garlic butter? It is the perfect make-ahead party food. You can even freeze them too! Who can resist a giant plate of crispy nacho chips smothered in gooey cheese, bacon, jalapenos and creamy jalapeno sauce? I can’t! Heaven on a plate. There are tons of packaged jalapeno flavored snacks on the market, some healthy and some not so much. Whether you are craving something salty or sweet, or healthy or indulgent, there is a jalapeno flavored snack for just about everything you can think of including chips, pretzels, nuts, granola bars, tuna, beef jerky and more. The sweetness from the mangoes, the spiciness from the jalapeno peppers and the bite from the splash of tequila takes your traditional guacamole to a whole new level. Ketchup isn’t just for kids! Add roasted jalapeno peppers to turn ordinary ketchup into a more flavorful and spicy ketchup that is grown-up approved. A slice or two of this dense and cheesy bread filled with spicy jalapeno peppers and crisp bacon is perfect for enjoying with a bowl of soup or stew. Pile soft, chewy buns high with tender, juicy chicken slow cooked in blackberry preserves, molasses, sliced jalapenos, ketchup and garlic for an easy and fulfilling weekday meal that will wow your taste buds and leave them begging for more. Jalapenos are not only for savory dishes…spice up your desserts with fiery, green jalapeno peppers for a sizzling sweet sensation! Sweet and spicy candied jalapeno rings taste amazing served as a condiment on burgers, pizza, sandwiches and even ice cream! They are also delicious eaten directly from the jar or tossed into a bowl of fresh fruit. This video teaches you how to make candied jalapenos with easy to follow and clear instructions. You will need some jalapeno peppers, apple cider vinegar, white sugar, garlic powder, cayenne pepper, turmeric and celery seed to get started. Making a batch of sweet-hot candied jalapenos is a great way to use up all the peppers from your garden at the end of the season. But, be warned, this cowboy candy is not for the weak! A super simple and easy to make recipe for candied jalapenos using only peppers, vinegar, sugar and salt. Whip up a batch of these for this year’s Super Bowl party and score a winning touchdown with your friends and family. Have You Ever Tried A Chocolate Covered Jalapeno? You will need to call the fire department to put out the fire in your mouth after you bite into one of these sweet and spicy firecracker treats! Eaten whole, chocolate dipped jalapenos are extremely hot! If you can’t take the heat, remove the seeds and membrane beforehand to reduce the heat to a more tolerable level. You can either remove the tops or if you want the stem to remain intact, make a slit down the back and scoop out the insides. These gourmet treats are so simple to make, even the most novice home cook can make them and they require only two ingredients; a quality milk, dark or white chocolate and a handful of fresh jalapeno peppers. You can mix it up and use a variety of sweet and hot chili peppers too. All you need to do is melt the chocolate in the microwave or in a double broiler, adding in a little shortening to make it more creamy and smooth. Holding them by the stem, dip the peppers into the melted chocolate, swirling them around until they are fully coated. 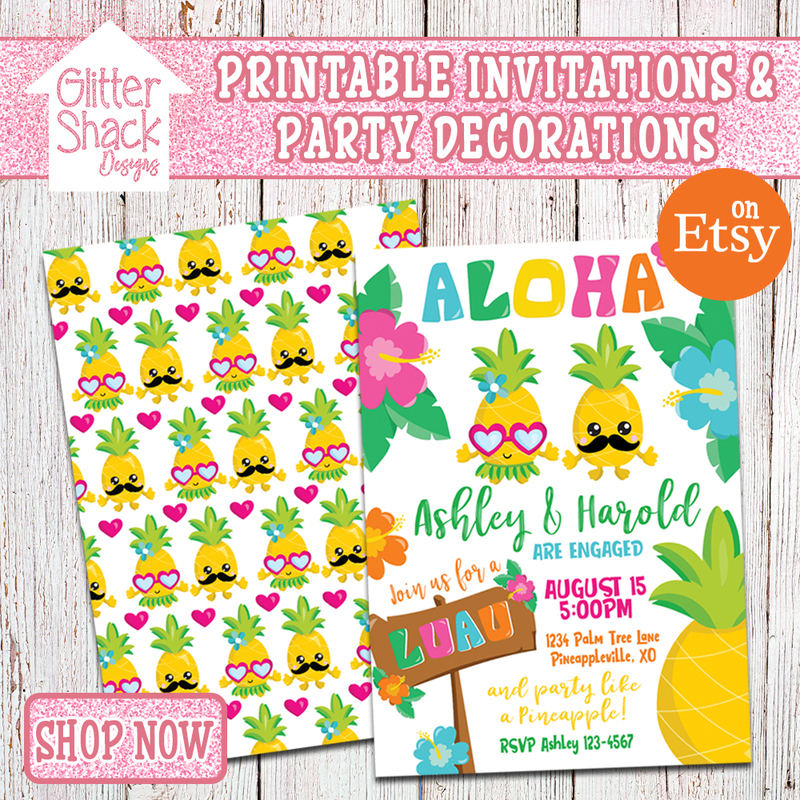 Place them on a baking sheet lined with waxed paper and put them into the fridge to harden. Chocolate, peanut butter and spice….hmmm! These fiery hot treats are pure heaven. Heat things up with fresh jalapeno peppers stuffed with a creamy peanut butter filling and dipped into melted chocolate for an extra spicy dessert. ABC news anchor, Casie Curry, shares her recipe for chocolate covered jalapenos with her viewers for a hot and spicy Valentine’s dessert idea for spice lovers. If You Love Chocolate And Spice, Then These Chocolate Jalapeno Recipes Are For You! Everyone’s favorite cookie undergoes a spicy makeover in these sweet and spicy chocolate chip cookies. Bet you can’t stop at just one cookie! Bite into one of these heavenly morsels of rich dark chocolate filled with sweet and spicy raspberry centers for a sinful treat that will set your mouth ablaze. These spicy chocolate balls are good for you and taste a little like a soft and chewy fruity chocolate granola bar. Best of all, they contain no sugar. Jalapeno Chocolates Make A Spicy Gift Idea! A refreshing blend of muddled strawberries, honey, lime juice, tequila, orange liqueur and a fresh jalapeno slice make a delicious margarita that is infused with subtle notes of sweet and hot. This sweet-hot jelly, paired with cream cheese and crackers makes a delicious party appetizer every will rave over. The jars of jalapeno jelly would also make lovely homemade gifts. 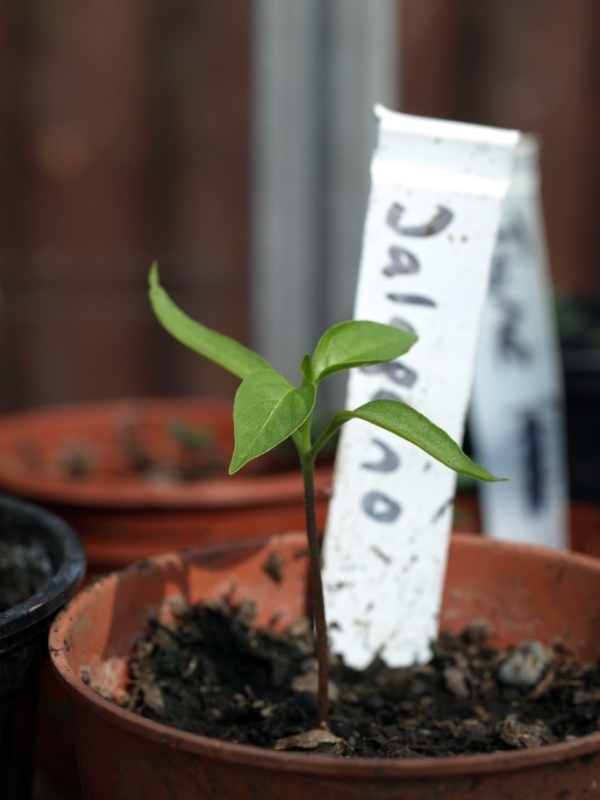 You can grow jalapeno pepper plants indoors or outdoors. They are a pretty hardy and forgiving plant to grow. They flourish in sunshine and warmth and do well as a garden plant in climates with a hardiness factor between 8 and 10. Start your plants from seed or buy some seedlings from a nursery, keeping them indoors for at least 8 weeks before transplanting them outdoors. You can also keep the plants indoors all year round, granted you have a warm and cozy spot with about 16 hours of indirect sunlight with optimal temperatures ranging between 60F to 85F. It may be necessary to use a heating pad to achieve and maintain these temps. The growing period of a single jalapeno plant is between 70 to 80 days, bearing between 25-35 pods and grows to 2 1/2 to 3 feet tall. Keep the soil moist, but not soggy and use a balanced fertilizer for the best results. 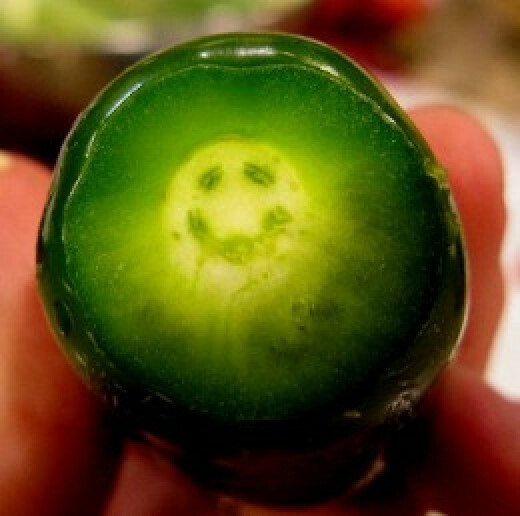 That’s All Folks And Don’t Forget To Smile And Be Happy While Cooking With Jalapenos! 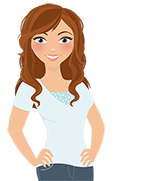 Thanks for visiting and I hope you found the tips for cooking with jalapenos and the selection of smokin’ hot jalapeno pepper recipes helpful!